The drama that plagues LinkedIn continued to unfold this morning with a shocking post from Ira Bass on Google+. 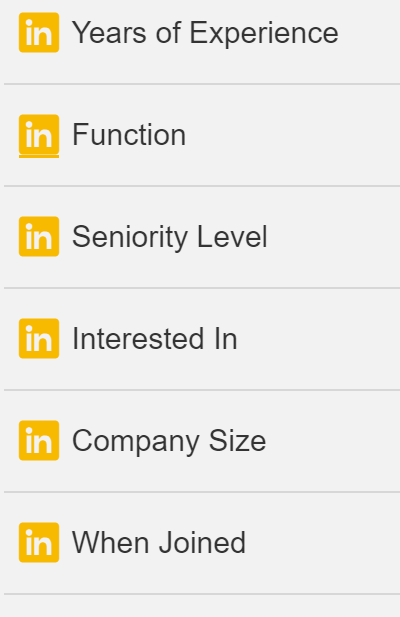 LinkedIn will soon be retiring the ability to search years of experience, function, seniority level, interested in, company size and when a user joined. 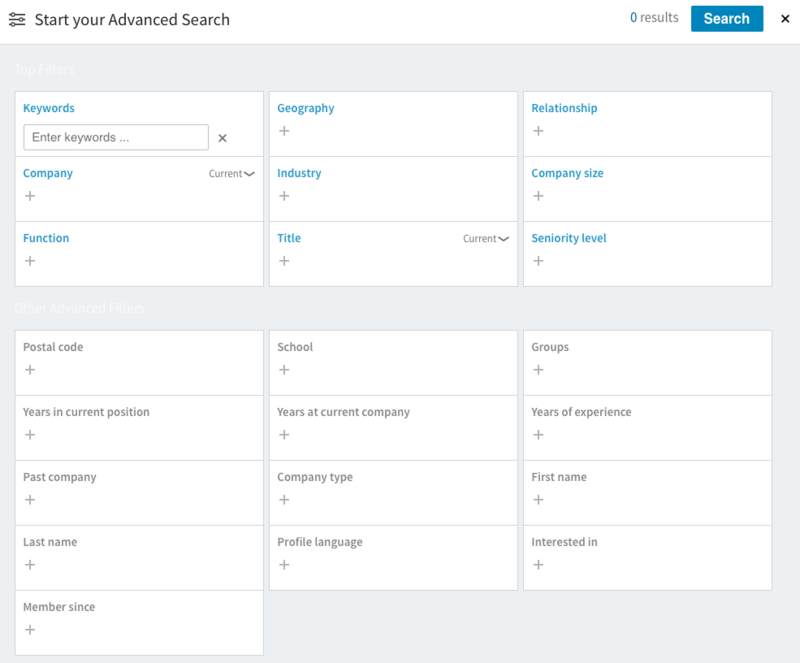 Also receiving the axe is the ability for Premium users to search within LinkedIn Groups. 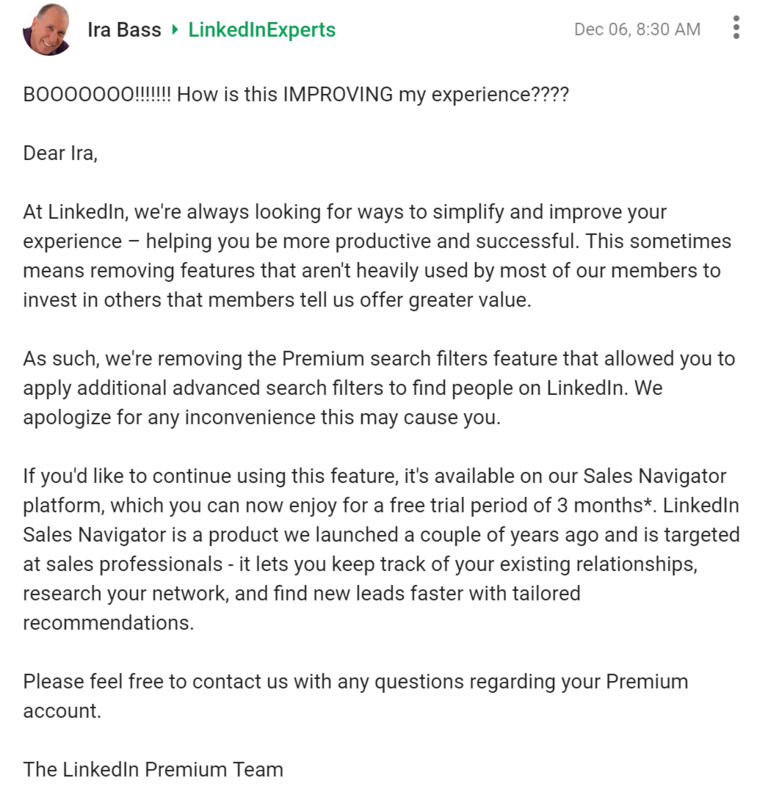 According to Bass, LinkedIn will likely roll out a new product which is similar to LinkedIn Premium Search. A Beta version was shared with Bass. LinkedIn followed up with a comment on Twitter to the Google+ post. This recent move by LinkedIn isn’t entirely shocking. Its users have seen many beloved products and features come and go over the years. 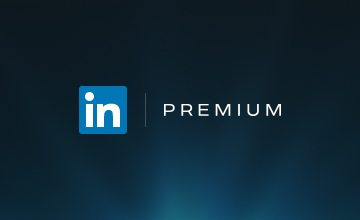 Different versions of LinkedIn Premium can run as little as $47.99 a month. Many sourcers and recruiters have gravitated towards LinkedIn Premium as an inexpensive solution to view more profiles and run more efficient advanced searches. 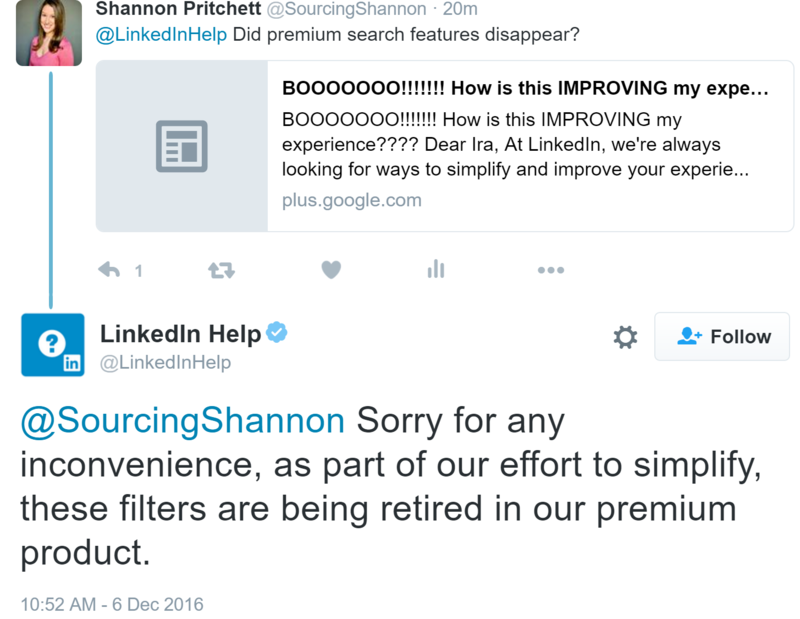 Without a Premium version of LinkedIn, basic users can be blocked from running as little as ten searches a month within LinkedIn. A LinkedIn Recruiter account can run upwards to thousands of dollars each month. The retiring Premium Search features are still available in Sales Navigator. LinkedIn has confirmed that it will keep this search ability within Sales Navigator. Just last week, news spread over many social sites that LinkedIn has started to block XRay (site:linkedin.com) capability through search engines. After extensive testing, it appears that you can still retrieve LinkedIn profiles through search engines, even when logged out of LinkedIn. Previously, LinkedIn removed its cap on the number of groups a member can join. In the past, LinkedIn limited its users to a maximum of 50 groups. Group interest and activity has declined on LinkedIn. Opening its limitations on groups will likely not increase a user’s involvement within them. Many social media users have become more adapt to using Facebook Groups over the cumbersome LinkedIn Groups. Facebook made news last month with a competitive push to allow Company Pages the capability to feature job postings. This new feature is predicted to drive more traffic to Facebook Pages over its News Feed.